What is Adobe InDesign CC ? Adobe InDesign CC is a desktop page design and layout solution created for businesses and graphic designers. The application helps users create, pre-flight, and publish documents for both digital and print media. 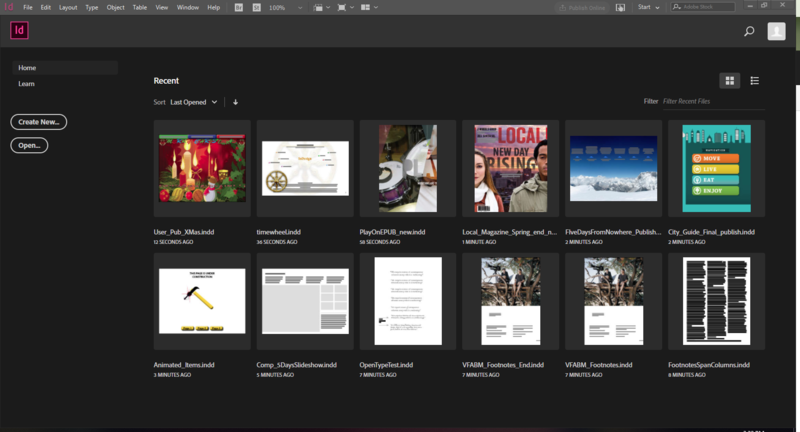 Adobe InDesign CC lets users design flyers, stationery, brochures, posters, magazines, books, and annual reports, with a wide range of professional layouts, images, and tables. It also lets users create interactive eBooks, PDFs, magazines, and other digital documents enhanced by slideshows, animations, audios, and videos. This software has tools that help designers collaborate with their editors and writers. This lets them design documents smarter and quicker. It also supports integration with Adobe Copy CC (a word processor created by Adobe Systems). Users can even share colors, texts, graphics, and shapes since the software lets users access Creative Cloud Libraries. Its latest version provides features that include endnotes, object height, width styles, paragraph borders, PDF accessibility improvements, fonts, and HTML export enhancements. The main benefits of Adobe InDesign CC are streamlining your designs for print, optimizing how you create digital publications, and improving collaboration with other users. The software offers features that help designers improve the accessibility and reusability of exported PDF documents. Before the exporting process is done, they can apply tags to the page items so they can be viewed through a web browser or handheld devices properly. Users can even tag items as figures, stories, or headlines. Alternative texts to objects or graphics that are tagged as figures can also be added. These alternative texts are words used to describe images and they help the visually-impaired readers understand the meaning implied by images. Users can also add tags to anchor text frames, footnotes, indexes, keywords, table of contents, and captions that have hyperlinks. Artifact tags are also available for unimportant objects, texts, or images users want to hide, allowing them to keep items when reflowing PDF files in Adobe Acrobat or reading on handled devices. Meanwhile, this publishing solution provides a feature for HTML exporting, allowing web developers to export clean and simple codes as they implement a website’s layout designs. It contains the capability to eradicate redundant div tags in HTML as well as insignificant content grouping. To seamlessly modify objects’ sizes and reposition them at once across documents, the software includes new options in its Object Style dialog box. This makes resizing multiple objects and changing width and height possible. Users can set values for X and Y coordinates so they can modify the positions of the objects. Furthermore, its Eyedropper tool can help users apply position or size instantly to another object within their documents.